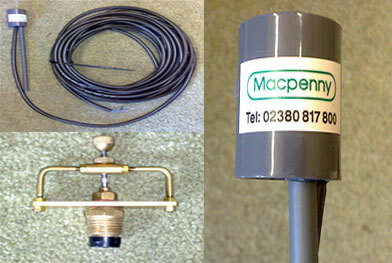 Macpenny Mist Propagation equipment, with over 40 years experience and manufacturing, is the most respected name in this field. The installation of a Macpenny system in the propagation house leads to an immediate and dramatic increase in plant production efficiency. 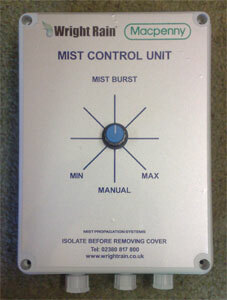 A range of system controls are available, to suit all propagation needs. Positioned amongst cuttings this unit is a moisture sensor which determines the frequency of misting. Moisture on the surface of the detector carries a current between its two electrodes. When the water has evaporated the circuit is broken, sending a signal to the Mist Control Unit, causing misting to commence. The Electronic Leaf is supplied with a choice of 2.5m, 5m or 10m cables to suit the individual bench requirements. The result of extensive development and careful design, this atomiser jet is suitable for a wide range of uses. Precision made of brass, with a stainless steel striking pin. The jet is produced in four sizes to suit the individual bench width. The jet incorporates an 80 mesh filter capable of stopping even the finest particle from interfering in the nozzles operation. Each jet can be isolated from the rest of the system by inserting a rubber disc or similar under the striking pin and screwing down the adjusting nut. Jet output can be varied + or – 25% by adjusting the striking pin clearance.